In late-July 2009, when I was doing freelance work to pay the bills, a recruiter approached me about a job opening at the Glasgow based agency-of-all-things, Curious Group. I’d long admired the work of Curious’ from afar, having browsed their website showcase even before I moved back up from Liverpool in 2008, so I was excited about the opportunity. However, when I saw the job spec I swallowed hard. Six years in the sheltered safety of Sony, followed by a gruelling year churning out Python for the purpose of content migration had left me a little rusty as a web developer. More rust, in fact, than I could shake off in the month of PHP and simple front-end work that the freelance project had me doing. But still, I decided I would just be honest in the interview and show a willingness to learn whatever was required should the job come my way. On an afternoon in early 0ctober 2016, I was having lunch with my friends, George and Adrian when we came up with the idea of travelling to see one of cycling’s spring classics. We usually enjoy a ride together to coincide with the classics, the gather in the pub to watch the race, but venturing to mainland Europe to see one in person was new territory for me. By the time we’d emptied our plates the idea was gathering steam, so I booked a table in Blackfriars for that evening where we could have a planning session. 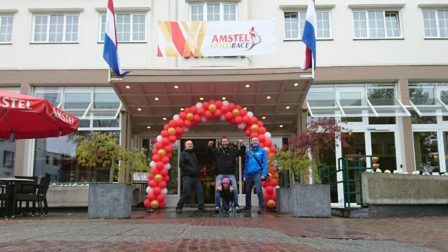 Later, gathered around a table by the window, we checked our calendars and quickly decided upon travelling to Maastricht for the weekend of the Amstel Gold Race. As quickly as the beers flowed that night, Operation: Amstel took shape. I took an unlikely organisational role, setting up the Trello board and filling it with to-do’s and ideas as they came to mind, George booked the appropriate flights, and Adrian found us quality bars to visit and a place to stay on Air B&B in the days that followed. In fact, the whole thing came together so quickly and was so far ahead of us that, over the winter, it was easy to forget that we’d be kicking off the spring in style. Around 25 years ago, when I was an apprentice electrician for the MoD, I would wait each summer morning for the bus to work at the submarine Base. An older guy, Tommy, whose name I had gleaned from the other bus stop folk who spoke to him, would usually be waiting there at that time in the morning, too. I quietly observed that Tommy was pretty eccentric. Even then he had a bit of a stoop to him and a face full of character. He would wait seemingly indefinitely on the bin lorry picking him up on the way past and he’d chat away about this and that to everyone who shared the bus shelter. I didn’t know what he was on about half the time, but I would still humour him on his chosen subject of the day because I liked Tommy. Even though I was a naive young man, somehow I was astute enough to appreciate that the world needed more people like him. He was a bin man, which, let’s be honest, is regarded as the lowest of working class jobs, but that didn’t stop Tommy talking to anyone and everyone as an equal. Apprentice electrician or bank manager – it didn’t matter to him and it’s a trait that I thought was admirable. He was a kind man with it. One time he saw me running in the distance and asked the driver of the bus I was clearly going to miss to wait for me. That was a big deal to me – I didn’t have the best timekeeping record as an apprentice and Tommy probably saved my bacon that day.